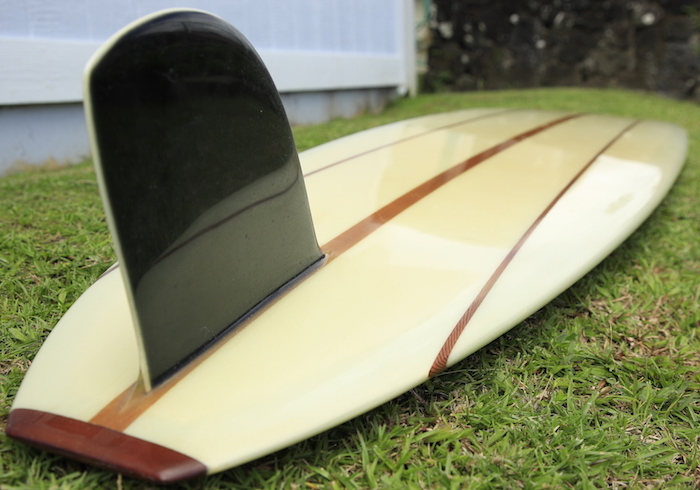 10′2 Reynold Yater shaped traditional longboard, classic 50/50 rail and 1960’s design with 3 stringer (Balsa & Cedar). Shaped and signed by R. Yater. This board has never touched the water. Renny Yater: Cool-handed surfer and boardmaker from Santa Barbara, California; innovator and prime exemplar of a smooth, low-key cental California surfing style; founder of Yater Surfboards. 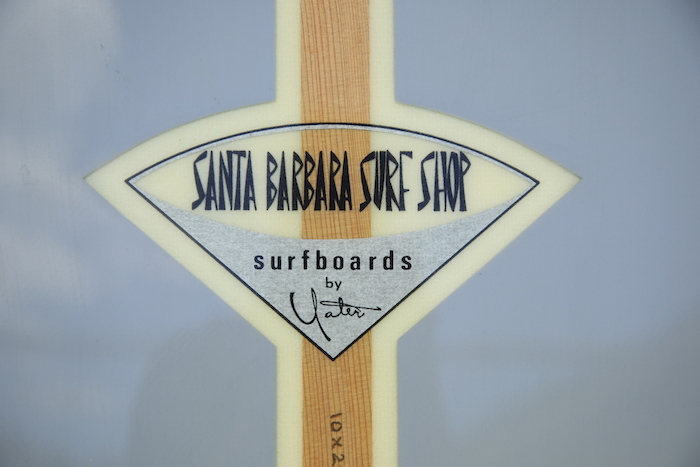 Yater was born (1932) in Los Angeles, the son of a shoe salesman, raised in Pasadena and Laguna Beach, began surfing at age 14, and started making his own boards at 21. 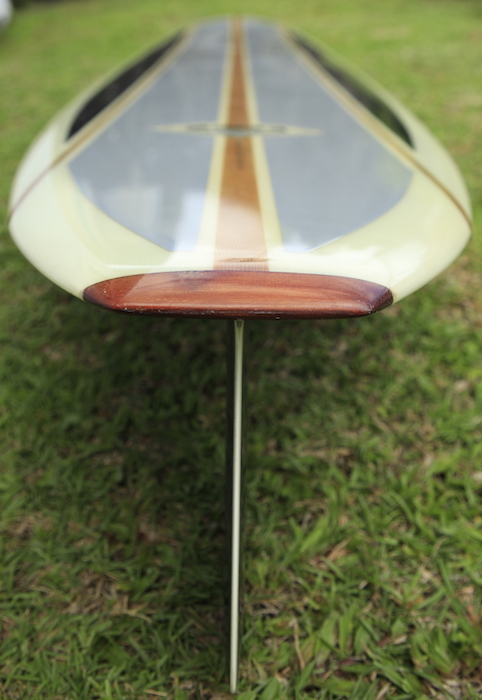 Thin, hawk-nosed, and quiet, Yater apprenticed in the mid- and late ’50s with the two biggest boardbuilders in the world, working as a laminator at Hobie Surfboards in Dana Point from 1955 to 1957, then as a shaper at Velzy Surfboards in San Clemente from 1957 to 1959. Where Hobie, Weber, Greg Noll, and other boardbuilders of the period entered the ’60s surf market bent on expansion and conquest, Yater purposely kept his operation small. 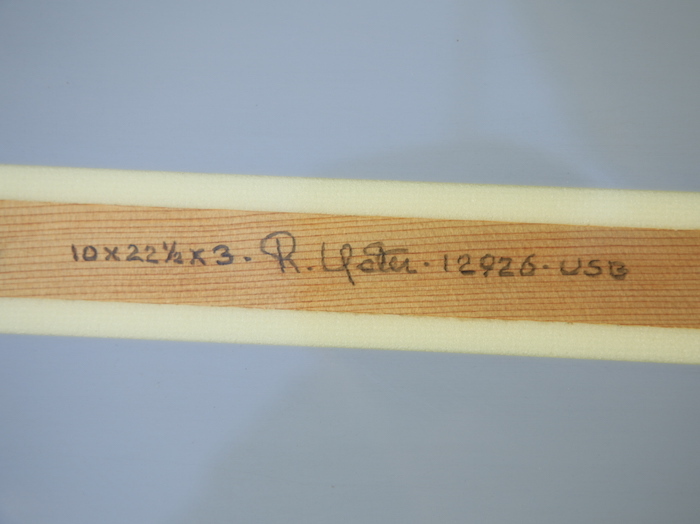 In 1964 he introduced the Yater Spoon, one of the era’s thinnest, lightest, and most maneuverable boards, which sold well up and down the California coast, and were shipped in small numbers to Florida, New Jersey, Texas, and Hawaii. Yater was a founder and president of the Santa Barbara Surf Club, created in 1959 as a way for a small group of Santa Barbara surfers to gain access to the wave-rich and privately owned Hollister Ranch, located just north of town. He was featured in a small number of surf movies of the late ’50s and early ’60s, including Surf Crazy (1959), Big Wednesday (1961), Surfing Hollow Days (1962), and Walk on the Wet Side(1963). As testimony to Yater’s high rank among discriminating California surfers, Colonel Kilgore, the war- and surf-crazed character played by Robert Duvall in Apocalypse Now, wears an army-green Santa Barbara Surf Shop T-shirt while on duty, and has a Yater Spoon tucked among his personal effects.